Mysuru: The Congress continued its dominance over N.R. Constituency by winning 13 out of the 23 Wards coming under the Assembly segment, which is represented by party MLA Tanveer Sait. While the JD(S) got six seats, BJP got three and independents secured one seat. While the Congress won in Ward numbers 8, 10, 11, 12, 13, 15, 16, 29, 32, 33, 34, 38 and 39, the JD(S) won in Ward 14, 17, 27, 31, 36 and 37, BJP in 28, 30 and 35 and Independent candidate in Ward 9. However, the BJP dominated K.R. Constituency winning in 11 out of the 20 Wards falling under the constituency. The K.R. Constituency is represented by the BJP’s S.A. Ramdas, a former Minister. While the BJP won 11, the Congress won five, JD(S) two, BSP and an independent one. The BJP candidates won in Ward numbers 47, 49, 51, 52, 53, 57, 59, 62, 63, 64 and 65, while the Congress won in Ward 43, 50, 54, 60 and 61, the JD(S) in Ward 45 and 48, BSP candidates in Ward 56 and Independent candidate M.V. Ramprasad, who contested as an independent after being denied the ticket by the BJP, won from Ward 55. The JD(S) won maximum number of seats in Chamaraja Assembly segment, which has 19 MCC Wards. The JD(S) won nine, the BJP six, independents three and Congress only one seat in Chamaraja, represented by L. Nagendra of the BJP. Out of the three Wards falling under Chamundishwari Assembly segment, two was won by BJP, while JD(S) one. The Congress drew a blank here. City Congress President R. Murthy said that the party has bagged 19 seats, thus coming second after the BJP. Thanking the voters for supporting the party, Murthy said that with no party getting an absolute majority in the MCC, the Congress will join hands with the JD(S) for coming to power in the MCC. 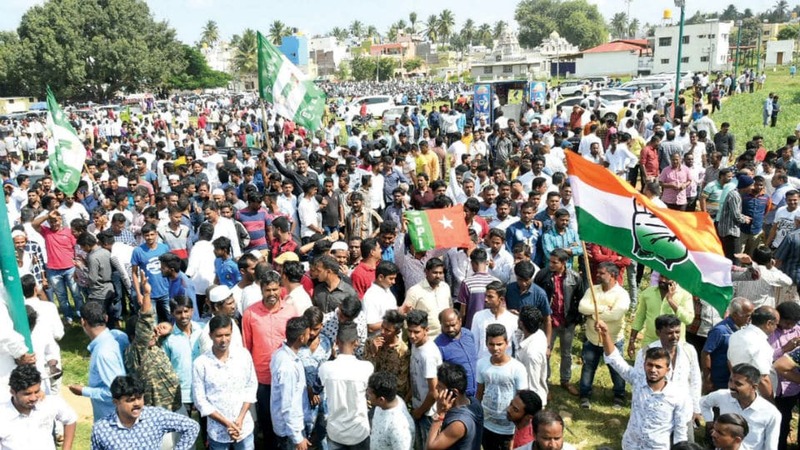 Noting that the Congress suffered a serious setback in Chamaraja Assembly segement, Murthy said that the party will concentrate on strengthening the party here ahead of the forthcoming Lok Sabha polls. Maintaing that the delimitation of Wards too contributed to the party’s rather poor showing, he said that the Congress would have won more seats had there been much time for poll preparations. City BJP President Dr. B.H. Manjunath said that the party has come first in the MCC polls, bagging 22 out of the 65 Wards. Pointing out that the BJP had imporved a lot over the years, he said that the party had hoped to win about 30 seats. But the party lost some seats by a slender margin and as such, the number came down to 22. Observing that the Congress and JD(S) are making efforts for a tie up to rule the MCC, Dr. Manjunath said that the BJP is waiting for the JD(S) moves. Asserting that the BJP was ready to sit in the Opposition, Dr. Manjunath said that the JD(S) and Congress had used money and muscle power for winning the MCC polls. JD(S) City President K.T. Chaluvegowda, who himself lost the MCC polls this time, said that the party had won 18 seats and its alliance partner the BSP one seat. Reacting to his defeat from Ward 4 in the MCC polls, Chaluvegowda said that he was in constant touch with the voters for more than two decades. Ponting out that perhaps the people of the Ward had sought a change, Cheluvegowda said that victory and defeat was common in the democratic system and he bowed to the verdict of the people. He further said that as city JD(S) President he would continue to build a strong base for the party agead of Lok Sabha polls.